Constructed from all Deep Cryo Treated parts this cable offers outstanding performance, top class build quality and sensible cost all in one! This cable fits Sennheiser headphone models HD545, HD565, HD580, HD600, HD650, HD-25SP. This cable is also lightweight, the standard 5 ft cable weighs in at only 75 grams. The TFA HPC-1 headphone cable can be ordered in several lengths up to 15 ft. Deep Cryo Treated Mogami 2893 is the base cable we use in the construction. This cable has four individual conductors of Neglex OFC copper surrounded by a pure copper spiral shield. We terminate the cable with Furutech FT-2PS Rhodium plated headphone connectors and your choice of Furutech FT-763(R) 1/4" plug or FT-735SM(R) pure copper 3.5 plugs. This cable can also be terminated with Neutrik 4 pin XLR. All connectors are Deep Cryo Treated. The cable is then finished in clear PET sleeve with printed shrinktubes. 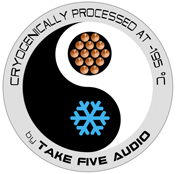 (1) 5ft Deep Cryo Treated TFA HPC-1 cable terminated with Furutech FT-2PS headphone connectors and Furutech FT-763(R) 1/4" phone plug. The price will adjust automatically if you select a different length or terminations. Solder termination is done using a precision OK International MFR Cartridge System and Mundorf Supreme solder. Select the cable length you need for your application, then press the order button. Cable length is calculated from tip-tip. The total cost of the cable will appear in the shopping cart at the top of the right hand navigation bar. Click "view cart" to see an itemized list of the cable options ordered. Shipping cost and any applicable taxes will be applied during checkout. Once the order is placed the cables are constructed to your specs and will ship next business day unless you decide to have it pre-conditioned on our cable cooker. Please allow three days for the pre-conditioning process. If you have your cable pre-conditioned (burned in) on our audiodharma Cable Cooker it will require only a minimal amount of time to reach it's full potential, typically about one day of normal use to settle in and another 2-3 days of normal use to reach about 90-95% of it's full potential.